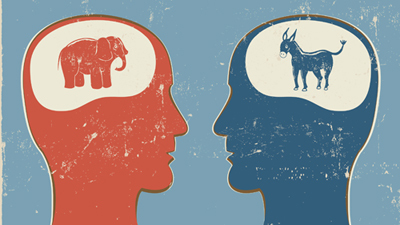 How hard it is to get someone to shift their allegiance from one political party to another is something that many of us know from personal experience, but it has also been demonstrated experimentally. For example, in subjects who were exposed to political ideas opposed to their own, researchers have recorded brain activity similar to that associated with the processing of pain or negative emotions. Conversely, when subjects were asked to justify their own political positions, their ventral striatum became more active, the typical sign of a pleasant, positive experience—in short, a reward. So does this mean that all of us are stuck in a self-referential loop that would significantly compromise the possibility of any genuine political debate? Perhaps not entirely. For example, researchers have shown that they can make people react more like conservatives (at least temporarily) by first exposing them to things that represent threats. But in a U.S. study that John Bargh and his team have published in the European Journal of Social Psychology, they describe the first experiment showing that it is also possible to do the opposite: make conservatives temporarily more liberal. How did they do it? Before asking their subjects a set of questions about social change, the researchers had them close their eyes and imagine that they were being visited by a genie who could grant them a certain superpower. For some of the subjects, it was the ability to fly through the air (regarded as neutral for the purpose of this study). For others, it was being invulnerable to any physical attack. The subjects who had imagined that they could fly then answered the questions about social change in a manner consistent with their party loyalties: those who were Republicans (and hence more conservative) gave answers less favourable to social change, while those who were Democrats gave answers that were more favourable. But the Republicans who had imagined that they were invulnerable gave significantly more liberal answers to some of the same questions, indistinguishable from the answers given by the Democrats in the “invulnerable” group. In short, the researchers had succeeded in temporarily transforming conservatives into liberals, simply by manipulating something that was deeper and unconsciously connected to their political choices: their relationship to their own security and survival. In other words, something that was ancient and hence closely related to their bodies, as is often the case with ancestral motivations of this kind. The same pattern applies to our instinctive aversion to germs and other microbes, which Bargh also cites. So it’s no surprise that Trump and other Republicans have tried to play on their citizens’ fears by comparing immigrants to viruses who want to invade them!